SIGforum.com Main Page SIG Pistols Smith 340pd? Anyone carry one of these? Or even just own for fun? Are they really worth over double what the 642 airweight goes for? Does it feel that much lighter? Last ok I’m not recoil sensitive generally buy the scandium snubs absolutely feel lighter then the pure aluminum guns on firing, but in my opinion aren’t light enough over the aluminum framed guns to make for some night and day carry difference. So, and I say this just for me, they come with all of the drawbacks of lighter weight, much greater cost and extra care for the cylinder with really no huge pros. I mean who really has a tough time carrying a 642?? Besides if I am going to carry one of these I would prefer to just set off a hand grenade in my hand as I feel I would get much, much greater stopping power with a tad less recoil. I lucked into a MP340 which is pretty much the same thing. I like the enclosed ejector rod and you can feel that it is a couple of oz lighter. The ability to put a front night sight on is also a big plus. It BLOWS in 357 MAG (full house). I made it through a full cylinder of five 158gr Speer Gold Dot 357s. It’s fine in 38SPL +P, I carry the Gold Dot 135gr short barrels. I have a 442 no lock - not getting rid of it but I only really use the MP340. Is it worth the cost? IDK, as I only paid a net $450 for my MP340 from a guy who was having a fire sale and sold it to me for $550 with $100 worth of Hornady ammo that I sold off. Its my BUG in the pocket or ankle piece. This mirrors my experience as well, both in use and cost. For what I paid, it was a no brainer. I dont think I would choose it over the 642 and normal retail prices. I'm with Rhino. I also got mine cheapish. They are notably lighter. I have an M&P340 and it's painful with 125 .357s and pretty much unusable with 158s. It also hit like 2 feet to the right from the factory, and still about 8 inches to the right since going back to the factory. YMMV. IMO not worth the price over the 442. I don’t know what model mine is, but it’s one of those special metal ones. Full house .357 is freaking brutal. Im not a recoil wimp, I can make it through a cylinder, but I have no part of me that wants to do a second cylinder. I damn near have to give myself a pep talk before the 4th and 5th rounds. As far as weight goes, I’m not sure I notice a difference between it and a normal 642 unless I hold them back to back. I do carry full House .357 in mine, so I guess it’s worth it. My hope/anticipation is that the adrenaline of a selfdefense situation will drown out the hand pain. I had one for a very short....miserable little gun to shoot with 357. It had a nice trigger , was noticeably lighter and surprisingly accurate ...but I never , ever regretted getting rid of that thing !! I have the 340SC, which is even lighter than the 340PD by an ounce or two. YES, it absolutely was worth it to me. I think I paid $700 for it, lightly used. I added Crimson Trace grips, so all in, it's an almost $1000 carry gun. Yes you can feel the difference in weight, yes it disappears in a pocket when a 442/642 doesn't. These are NOT range guns. They are special purpose carry guns. If you want the lightest, full power carry gun you can buy, then this is it. If you want to shoot hundreds of rounds at the range, then this is not your gun. .357 is overkill and probably should be avoided. A good stout .38 special Speer Gold Dot 135+p is about as hot as you'll want to carry/shoot. I carried mine every day for about 10 years. Lately I carry an auto, but I will NEVER sell that scandium frame, scandium cylinder 340SC. Good stuff guys thanks. They seem pretty pricey online so I wanted to see if they were all that and a bag of chips before I got serious. So you folks who are proponents of these seriously see a marked difference in carry vs a 642/442? I mean guns are personal and everybody is different but my take is if you think a 642/442 is to onerous to carry a scandium version isn’t gonna be a huge difference. The “footprint” is the same and the weight loaded isn’t a ginormous difference to me. If and it’s a BIG IF you are going to run .357 Maggie with these then yes they are a far cry from a 640. If you are running .38/.38+p they simply IMO are not light enough from a 642/442 to justify the recoil/cost/maintainence. The reality of these guns in my opinion is that they simply offer far diminishing returns in weight with no foot print difference while being downright punishing to shoot. That being said if I remember correctly Lincolnsisecho owns a Mark23 so it’s only fitting he or she owns a scandium Smith or Seecamp to balance their Chi Ying for their Yang so to speak. For MSRP, for most J-frame users, I don't think it's worth it. But the 340 weighs 3 oz less than a 442 - which doesn't seem like a lot, but its 20% of the weapon's weight. And I didn't buy it to shoot 357s, although it's nice to have the caliber options I guess, but it's a 38+P gun for me. I have a 340PD. I like the lil thing. I got it for a great price, which helps. In my opinion, is that extra price worth the few less oz? No. Id go with the 442/642 and call it a day. Use .38+P in it for self defense, and you're GTG. Pushing a .357 Mag round through the 340 is like being kicked by Bruce Lee when he's pissed off. Coupled with the fact that a 2in barrel isn't long enough for a Magnum round to pick up velocity to get the Maximum effect of the round. Both the 340 and the 442/642 are phenomenal pocket pistols, and if I had to do it over again, I'd go with the 442/642 and spend the extra $ on ammo. This IMO is worth way more then the weight. I have carried the 340SC for a decade or so. With the Crimson Trace grips with the air pocket the recoil is tolerable. With aluminum 357 cartridges the weight is virtually unnoticeable. The shape is an easy pocket draw even sitting and a cramped Corvette. Basically worth the money if you are not cash poor. Alternately I carry a Sig P938 with ARX plastic bullets to reduce the carry weight. While both work well with jeans and dress pants with a good belt, neither work with scrubs due to pocket design and lack of a good belt. It was the big dot tritium front sight that sold me. 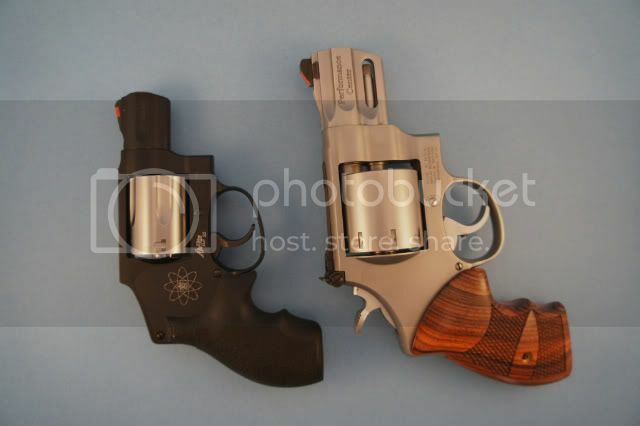 And I like the versatility of 357 mag. Aluminum cartridge casings make the difference? Interesting. What is that, a quarter ounce lighter? Ha ha yeah it would be at the opposite end of the spectrum of my Mark 23 for sure! Quick Reply to: Smith 340pd?